A new addition this year to my Thanksgiving menu is a green salad with persimmon and pomegranate. The Thanksgiving table is generally brimming with traditional foods that are rich and heavy on the palate. This seasonal salad adds freshness, flavor, and crunchiness to the mix. 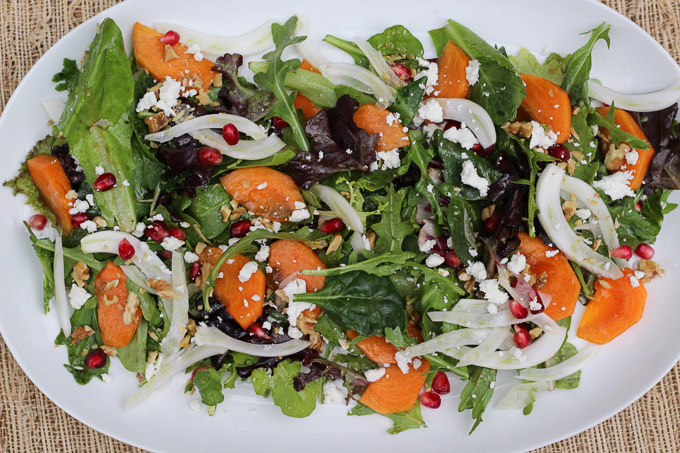 The persimmons and pomegranate seeds make a stunning addition to the green salad with their bright orange and red color. Persimmons are in season from October through December. The two varieties commonly available are Hachiya the astringent type shaped like an acorn; used for puddings and cakes and Fuyu the nonastringent type shaped like a squat tomato; perfect for salads and eating out of the hand like an apple. For this salad, you want a firmer Fuyu persimmon. Pomegranates are in season September through December. In addition to the persimmon and pomegranate, I added some thinly sliced fennel, toasted walnuts, and just a sprinkling of goat cheese to the salad. The vinaigrette is made with pomegranate molasses and a blend of walnut and extra virgin olive oil. The pomegranate molasses (available at Amazon or you can make it yourself by reducing down pomegranate juice) is a secret flavor enhancer that adds a sweet and tangy element. I also like to use it on roasted vegetables, slow-cooked meats, and marinades. 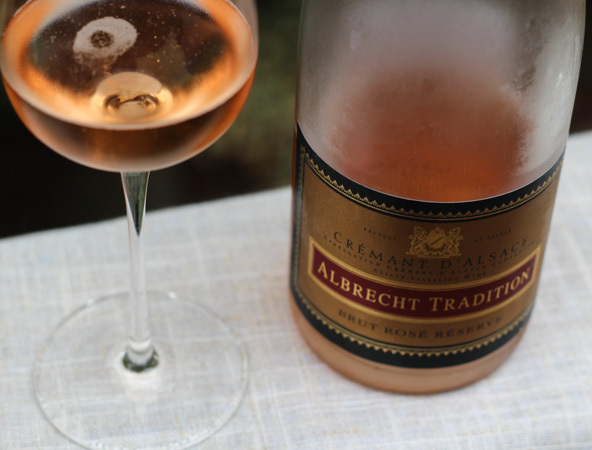 The salad pairs beautifully with Lucien Albrecht Crémant d’ Alsace Brut Rosé. Bright pink in color with small tiny bubbles. Medium acidity and body. On the palate red fruit; strawberries, red currants, and wild cherries. A round soft mouthfeel with a lingering finish. Flavor Match – The red fruit flavors in the wine are echoed in the salad with the pomegranate seeds creating harmony on the palate. Acidity Match – The acidity in the wine is balanced with the acidity of the vinaigrette. Texture Match – The smooth, soft mouthfeel of the wine is congruent with the smooth rich texture of the persimmons. This salad is perfect for the holidays when persimmons and pomegranates are in season September/October through December. Pair the salad with a sparkling rosé brut with plenty of red fruit forward flavors. In small/medium bowl, combine vinaigrette ingredients and whisk to mix. In a large bowl, toss the salad greens with just enough vinaigrette to moisten the greens. Plate the greens on a large serving platter or small plates. Arrange the persimmon slices, pomegranate seeds, fennel slices, and walnuts on the greens. Drizzle just a little dressing over the salad and sprinkle the goat cheese on top. Add more vinaigrette as needed when serving. Love you’re highlighting the Fuya Persimmon, one of my favorite fruits! This salad will be a fresh bright spot on your Thanksgiving table. Walnut oil with them… nice combo!